Defense Minister: Iranian nuke program entering "immunity zone" after which stopping it will be impossible. Defense Minister Ehud Barak delivered a forceful message Thursday regarding the urgency of stopping Iran's nuclear weapons program, hinting that a military strike on Iran could be imminent. 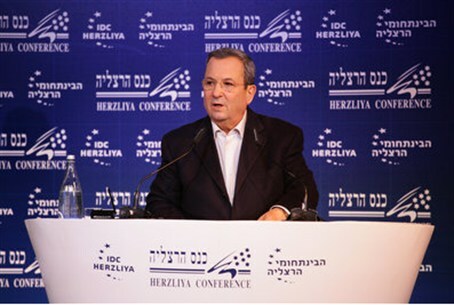 "He who says 'later,' may find that it is 'too late,'" Barak said, incorporating the English words into his speech at the Herzliya Conference. "Today, unlike the past, there is wide global understanding that it is vital to prevent Iran from going nuclear and that no option must be taken off the table," he said. "Today, unlike the past, there is wide global understanding that if the sanctions fail to achieve the desired result of stopping the Iranian military nuclear program, there will be a need to consider an operation." Many analysts estimate, he added, that dealing with a nuclear Iran will be "more complicated, more dangerous, more costly in blood and money, than stopping it today." "Today, unlike the past, there is no question of the unbearable danger a nuclear Iran poses for the future of the Middle East, for the security of Israel and for the security and financial stability of the entire world." "Today, unlike the past, the world has no doubt that the military nuclear program is steadily nearing ripeness and is about to enter the 'immunity zone.' From that point on, the Iranian regime will be able to act to complete the program, with no effective disturbance and a time that is convenient for it." The latest round of sanctions on Iran are "a step in the right direction and they should gradually be made more severe until the goal of stopping the nuclear program is reached – if it is reached," Barak said.